Dormant seed, if it is viable, respires either gaining or losing moisture. Passiflora seed generally does not keep well but will be triggered into germinating by the right combination of moisture, temperature & soil. Some seed have even more specific needs such as smoke or being exposed to stomach acid. The germinating seed is totally reliant on its on board stored energy until it pushes its growing tip above the soil. This main growing tip (the apical meristem, later lateral ones are just meristems) is responsible for all the plant’s growth above ground & similar growing tips at the end of the roots are responsible for all growth below ground. The leaves absorb light energy from the sun using carbon dioxide & water to produce sugars and other organic molecules. At night when there are low light levels sugars are broken down releasing carbon dioxide & water to keep energy production going. At maturity, which can be defined as having the ability to produce ripe fruit, the flowering sequence is initiated by the master gene so that as the plant continues to grow it also produces flower buds. 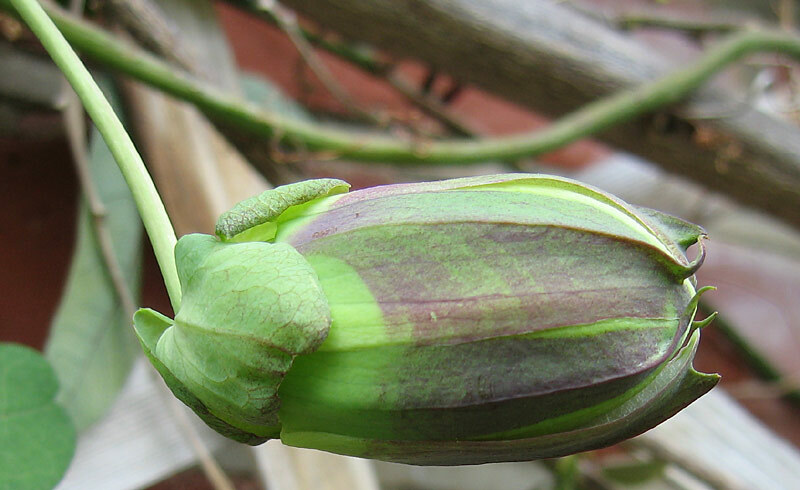 These in turn develop into flowers, which are pollinated either by the wind, or more commonly for Passiflora by pollinators such as bees, moths, butterflies & other insects, bats & hummingbirds. Pollinated flowers then turn into fruit as the fertilized ovary swells with the seed inside & the flower crumples. The fruit usually drop to the ground once ripe. A plant that lives for a season or year only….such as P. gracilis, the Annual Passion Flower. It will grow, flower, set fruit containing seed, and die within the year. A plant that needs two growing seasons to complete its life cycle. It grows foliage in the first year, rests over winter & flowers, sets fruit, and then dies at the end of the second year. I know of no Passiflora that follow this pattern but may be wrong. A plant that can live for 3 or more years. It may grow, flower, and set fruit in its first year & repeat the pattern for many years after, but equally may take a number of years to grow to flowering size e.g. P. membranacea. Some Passiflora die back each winter & regrow new stems from the roots, plants that can do this are described as herbaceous e.g. P. incarnata. Others as they mature produce more permanent woody stems but still look vine like, & a very few have become trees e.g. P. lindeniana.